Construction is moving along at One Vanderbilt in Midtown, with work on the lower floors now rising past the cantilever. Thanks to images by Tectonic, we can see the tower has reached its maximum width. It is now nearly the same height as Grand Central Terminal, which peaks at 130 feet. Several companies have recently signed on for space, with Greenberg Traurig announcing plans to move their center of New York Operations into the supertall, acquiring a fifteen-year lease for four continuous floors. The base of the structure is no simple production. Over several layers, it creates open spaces and an atrium peaking at 105 feet. 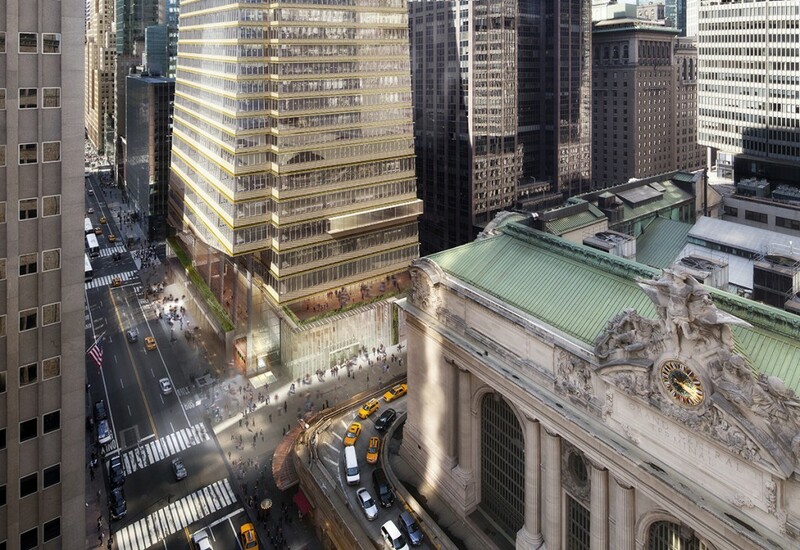 The tapering of the cantilever, as seen in the images, was designed with the Grand Central terminal in mind, and the larger glass windows allow for viewers inside to see the West side of the station’s façade. Since this intricate level has now been assembled, floors above will be quicker to finish. It’s not yet a looming spectacle for the bustling foot traffic below, but the exposed steel beams provide a glimpse into the incredible engineering capabilities one may take for granted. The supertall structure will peak at 1,401 feet, with design by Kohn Pedersen Fox, and development by SL Green. 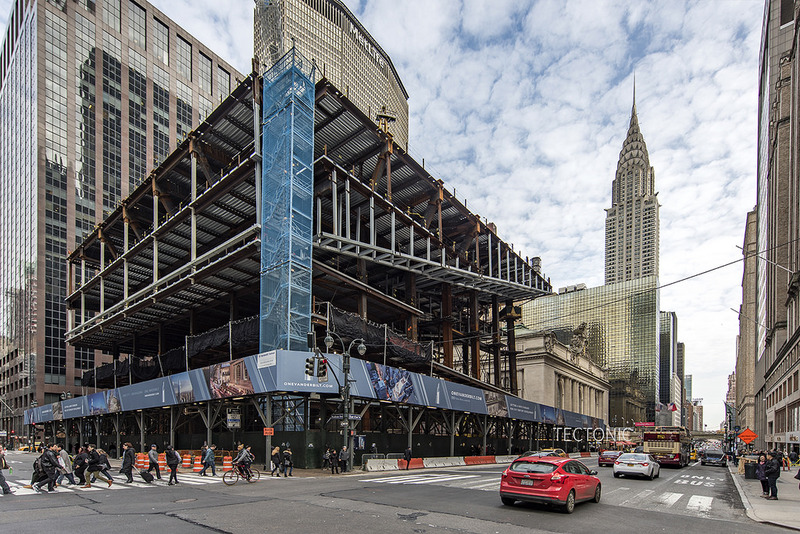 The project maintains its expected completion date of 2020, 107 years after the opening of Grand Central. 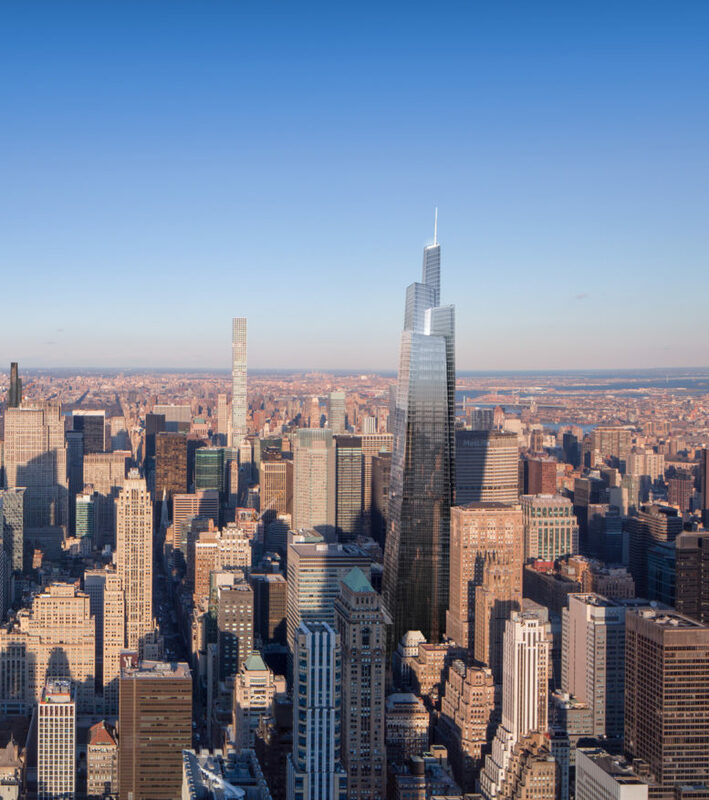 7 Comments on "One Vanderbilt Begins Rising Above Its Retail Podium, Midtown East"
Please pardon me for using your space: New mountain going up to the sky, its height and huge structure I impressed. I still think there is something clunky about those sliced off lower floors. I couldn’t agree more, except I think the entire building is out of place and clunky. The cantilevered portion fronting 42nd Street simply looks awkward, unstable and confusing. If its four long columns were meant to echo Grand Central Terminal’s facade, then that idea should have been carried further – with columns along the entire length of a flat horizontal atrium, one that matched the height of the terminal’s main bulk, at around 100 feet in height. 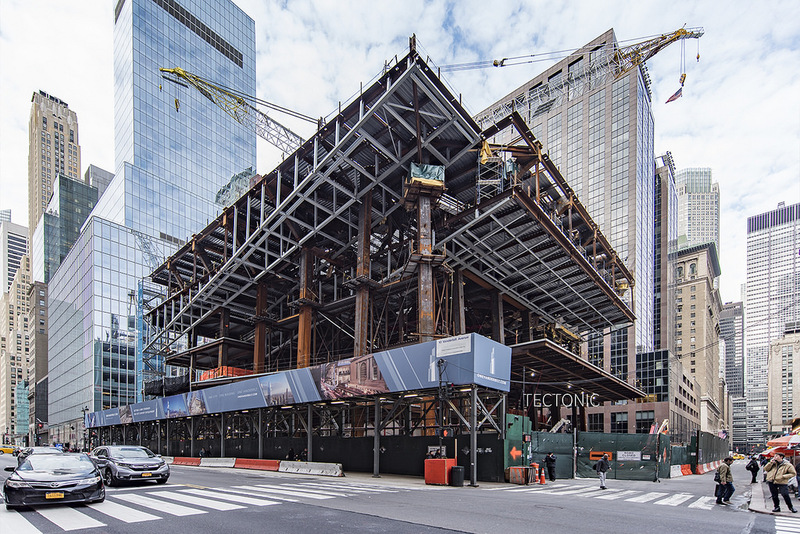 That would have aesthetically fit in much more gracefully with the measured and stable proportions of the Terminal, instead of the skewed & slanting hodge podge facade now rising at One Vanderbilt. The tallest column nearest the terminal actually looks to be slanting westward, away from the Terminal, adding to the fun-house mirror effect. What a wasted architectural opportunity in one of Manhattan’s premier locations. That would have looked great. Excellent comment. people on here talk about how out of place this building looks until it is finished. than they will see how beautiful it is on the amazing nyc skyline. Will there be a Shake Shack?